This free standing telephone cabinet, designed with clean and simple lines, is a great selection to complement your home decor. Bedside Tables. A stunning mirrored bedside table from our elegant and chic York Collection. The bedside table has one storage drawer great for storing a hair brush, makeup or any other small accesories within. Corona Grey Bedside Cabinet. 1 Door, 1 Drawer. Grey Washed Pine with Waxed Top. Here's our standard bedside cabinet from our Corona Grey Washed range. The door can be hinged to either side during the build, so if you need a pair you're covered. Made from pine, the top surface is left unpainted but is waxed for protection and appearance. This piece features a fantastic solid pine build with a white wash finish. It has a single door and drawer making it a handy piece of furniture for storing away all your bedside essentials. All Isle of Wight. Made using responsibly sourced pine wood, the bedside cabinet is strong, sturdy and very spacious. What should I do when it arrives?. Beautifully designed with a grey finish, the Brazil Grey 1 Door 1 Drawer Bedside Cabinet is both stylish and a useful addition for any bedroom. What should I do when it arrives?. 1 x Lynx 3 drawer bedside. Modern and elegant bedside table/cabinet. Three drawers for plenty of bedside storage. Upgraded and sleek, the Lynx bedroom range combines a high-gloss finish with bold silver detailing to make any space feel contemporary. This is the 3 Drawer Bedside Chest from Birlea's Lynx range. Spacious drawers provide space for all of your bedside belongings. Modern and elegant bedside table/cabinet. Three drawers for plenty of bedside storage. 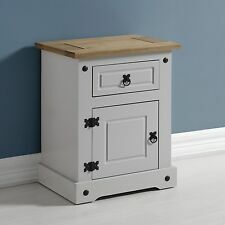 Corona 1 Drawer Bedside Cabinet Matt Grey. This elegant 1 drawer bedside cabinet isfor rooms where space is limited. It's completed with a handy drawer for storing essentials, ranging from underwear, charging cables or your favourite book. Pair of mirrored bedside tables from our elegant and chic York Collection. 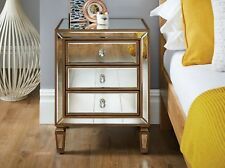 The bedside tables have one storage drawer great for storing hair brushes, makeup or any other small accessories within. The drawer and cupboard each have a crystal effect handle which adds to the beauty of these bedside tables. 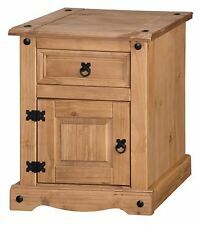 Corona Pine Bedside Cabinet, 3 Drawers. With/Without Dovetails. Waxed Finish.